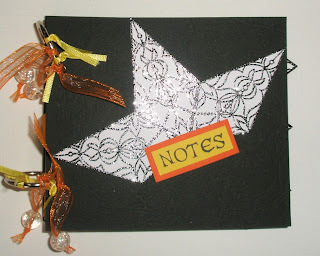 Another project with the Decorative Diamond stamp from Oak House Studio - this time a little notebook. Firstly I randomly sprayed an A3 sheet of white linen card with Colour Chemistry Ink in a Bottle - Citrus Yellow, Citrus Orange and Glorious Gold. 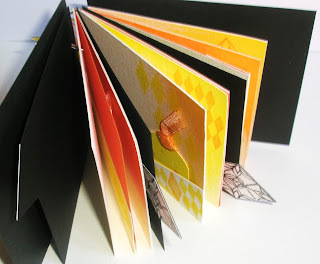 I then cut it up to create 9 pages, some with pockets, and backed it with orange and white card. I stamped the pages with Colour Chemistry Pigment Ink Pads - Lemon Yellow and Daffodil - and used various Oak House Studio stamps - the Decorative Diamond, Small and Large Harlequins and the Small Squares and Tag Palette Stamps. I've used Decorative Diamonds (embossed with Midnight Sparkle Embossing Powder) to create tabs on the section dividers and also to decorate the cover. The little book is held together with ring binders and decorated with ribbon. Lynnda will be at the Oak House Studio all weekend crafting for 24hrs with just this one stamp to show how versatile a stamp can be. She'll be stamping on card, wood, glass, metal, silk etc. If you are local (East Yorkshire) you are welcome to pop along to the Studio between 10am-4pm today and join in the fun. Otherwise follow the event online, I'm posting here all weekend, the Design Team have projects on the OAK HOUSE STUDIO BLOG and others are posting on the ONE STAMP page on Facebook. Why not take a look at what we've been up to and leave a comment or two!! Come back later for more inspiration and many thanks!